Speed at the point-of-sale is critical to any bar’s success … and when it comes to speed, we exceed the limit. 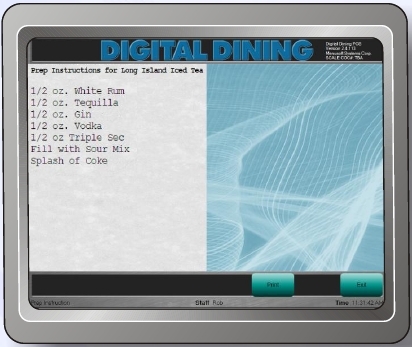 Digital Dining’s bar screen displays 48 “top sellers,” the items which typically account for over 80% of sales. ”Fast-Cash” sales couldn’t be quicker: Tap the drink items, the Cash button, and you’re done. Opening new tabs is just as simple: Tap the drink items, then the New Tab button, and the POS automatically creates a tab number. When it comes to running a bar, it’s important to have an effective and useful point of sale system for your cashiers or bartenders to use. A great bar POS allows your bartenders and servers to accurately and easily track each customer or table’s orders, drinks, and running totals throughout the day, transfer tabs to other servers, and alter existing orders. By turning to our company when you need a cost-effective and easy-to-use bar POS system in North Charleston, SC, your bar or restaurant is sure to improve in its service and speed. Get in touch with our company to discuss our range of effective and reasonably priced point of sale systems for bars. We’ll help you choose the best option to suit your business’s needs. With our bar POS systems, you’re able to manually enter a customer’s name while opening a new tab. Using our pre-authorization feature, you even can create a new tab by simply swiping a customer’s credit card. When the customer is ready to pay, your server or cashier can easily find the customer’s tab by sorting all the tabs alphabetically. With only one touch, your bartenders can change any drink to a double. The POS automatically adjusts the item’s pricing and calculates the inventory reduction according to the drink’s size. This reduces the amount of time your servers need to spend at the register instead of with the customers or on other tasks. Our bar POS systems use a large sales total display, which can assist customers, secret shoppers, and management auditing. The POS can automatically change menu item prices based on the time of day for happy hour, entertainment, or other promotions. The POS can make up to nine price changes per day. This makes it significantly easier to charge different prices without having to enter the POS system and change each price manually. The bar POS displays and prints drink recipes, which helps inexperienced bartenders prepare uncommonly ordered or complicated drinks. This also makes a great PR tool for customers who request recipes for popular drinks or house specialties. During shift change, incoming bartenders can pick up all open tabs from an outgoing bartender with a single touch of a button. In addition, bartenders can also transfer one or more bar tabs to a different server. Ensure staff integrity by having bartenders account for the cash in their drawers by performing blind drops without a target total. These drops are included in bar POS reports that managers can use later to reconcile their bartender’s cash drawers. This holds your staff accountable for their sales and helps keep track of income and sales throughout the years. Maintain accountability and inventory accuracy with our bar POS’s security camera interface. Our integrated security camera interface allows you to monitor and record what drinks are poured and what price is entered for each transaction.